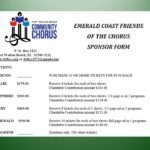 Introducing our new Sponsorship Program…..Emerald Coast Friends of the Chorus! We have changed things up a bit to encourage more donations to the FWBCC Memorial Scholarship Fund. After all, our scholarship fund is the primary reason for why we do what we do. Becoming an Emerald Coast Friend of the Chorus is easy! There are six levels to choose from: Friend, Pearl, Sapphire, Ruby, Emerald, and Diamond. Fill out the sponsorship form and mail with your check to: FWBCC, PO Box 2221, FWB, FL 32549. Will you become an Emerald Coast Friend of the Chorus today?